All waxes and sealants exhibit a characteristic called softening of the shine that occurs over time. Modern waxes and sealants can protect your vehicle's finish for months and months but that doesn't mean your vehicle will have the same stunning shine it had when it was freshly "waxed." Repeated washings and exposure to the environment diminishes shine over time. To combat this phenomenon, our chemist developed BLACKFIRE Synthetic Spray Wax. While Synthetic Spray Wax removes dust, fingerprints and surface smudges like a quick detailer, it is actually an advanced polymer sealant in an easy-to-apply spray. Boosted with Polycharger, BLACKFIRE Synthetic Spray Wax offers tremendous cross-linking capabilities to reinforce the existing paint protection. It bonds equally well to both paint sealants and carnauba waxes, extending surface protection and renewing that elusive "just-waxed" shine. Use over any wax or sealant! Particular attention was used making this spray sealant trouble-free on black and red cars, even in climates of high heat and humidity. You will not have problems with hazy patches, streaks or cloudiness. Just a rich, uniform shine! 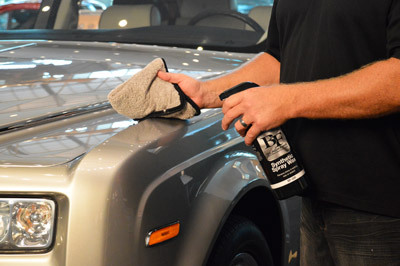 Use Blackfire Synthetic Spray Wax after washing or anytime to restore that “just detailed," wet-look shine. For best results apply BLACKFIRE Synthetic Spray Wax out of direct sunlight. Use very sparingly. Mist the paint lightly and use a microfiber towel to spread it over one section at a time. Flip the towel to a clean side and buff to a clean, slick shine!